Datuk Vincent Tiew with a model of The Arc@Cyberjaya project. ANDAMAN Property Management Sdn Bhd (APM), which is currently undertaking its largest property project by far The Arc@Cyberjaya in Cyberjaya with a gross development value of RM700mil expects to sell all of its 1,000 units by year-end. APM was incorporated in 2009 as a property management and property-related services company by a few individuals of the previous management of the Andaman Group, an established property developer. APM executive director and head of sales and marketing Datuk Vincent Tiew says since the company's formation, it now has ten property projects in hand with a total gross development value of RM2bil. “We have been operating for only three years and I believe we have come far to anchor ourselves as a respectable property management company; our clients are mainly property developers and landowners,” he tells StarBizWeek in a recent interview. Tiew says The Arc@Cyberjaya, the company's single largest freehold property project is expected to be launched in March. “We have several phases to the project. The first phase will comprise 250 units priced at an average of RM350,000 per unit. The Arc@Cyberjaya should be fully occupied by 2015,” he says, adding that the property project would be an iconic landmark in Cyberjaya once the apartments and 15 badminton courts with five office/campus tower blocks are completed. 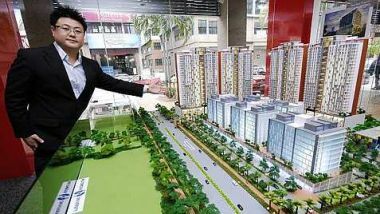 Tiew is confident of full occupancy for the project as the company has provided “strong incentives” for home-buyers. Homebuyers of The Arc@Cyberjaya can expect an 8% gross rental guarantee per annum for up to 25 years based on the company's four-year + four-year lease-back-option for six times plus an additional year. “We can afford to guarantee the gross rental rate because we have a contract with the Multimedia University to provide hostel like accommodation for first and final year students,” Tiew points out. The owner of The Arc@Cyberjaya is developer Maju Puncakbumi Sdn Bhd. It is APM's strategy to price their property units at “affordable” levels for the mass market. “We generally build homes for the mass market and price them to allow for favourable upside in capital gain in the medium term with secured rental-yield return,” he elaborates. He points out that some of the company's other property projects also have a gross rental guarantee of 8% per annum, but the tenure was shorter. They include the Cova Villa at Kota Damansara comprising 346 units at an average of RM300,000 per unit with three years and another three years lease-back-option. Cova Villa at Kota Damansara, which was completed in 2009, says Tiew mainly caters to the students of Segi College. Yet another property project of APM Casa Residenza at Kota Damansara, which has a GDV of RM126mil comprising 357 units at average price of about RM380,000 per unit was launched last year and was sold off within two days. The property project also has a three-year + three-year lease-back-option at 8% gross rental guarantee per annum. Its recently-launched 44 units of commercial shops at Kota Damansara was also sold out within two days for the total sales value of RM135mil. Construction is in full steam now and completion with Certificate of Fitness is anticipated within 18 months from sales and purchase date. Other upcoming projects include the Selangor Science Park 2 in Cyberjaya (GDV RM180mil), The Academia@South City Plaza in Seri Kembangan (GDV RM65mil) and four and five-storey shop offices that include a mall at Bangi with a GDV of RM500mil. APM markets its property projects via its five sales galleries located in Bangi, USJ, Kota Damansara, Ipoh and Johor Baru and it has a strong 2,000 odd loyal existing customers/buyers for the various projects in the pipeline. According to Tiew, the company plans to brand itself as a premier property management company that provides developers and landowners the option to leave the job to APM to fully build and manage their properties. “APM has the expertise to customise a building for a developer/owner and to run the day-to-day property-service related activities including rental and tenancy management, security, billing/credit control, carpark management, and food and beverage,” he says. “We have scalability and can source for building materials at very competitive prices because we constantly have ongoing property projects,” he adds. Is it more viable to buy or rent a house?